Humble yourself..Break one – you break them all. Well ya’ll… It’s been FAR too long since I have taken the time to sit down and blog. But today, I blog. Let’s just say that I had an experience earlier in the week that was worth writing about. On this blog I have spared no expense sharing my heart. You all know that I am a sinner. The whole reason I came back around to Christ was because my life was headed in the wrong direction, and filled with sin and suffering. I am not too self-righteous to admit this. However, I want to share with you – there are a lot of people who are. I feel bad for those. My heart reaches out for those who appear to themselves “on a high horse”, and some of them – I am finding – are “Christians”. That’s not the way it was intended to be. We are called to BE THE GOOD in the world. When we see someone who has overcome sin, hurdles, and obstacles in life, it’s not up to us to judge or condemn. I ran into a person in a restaurant the other day. To say the least, it was an unpleasant meeting. She called me by name as I was walking out, I responded and walked over, then she asked: “you’re a Christian blogger right?” To which I replied “yes.” Then the fun began! (sarcasm). Sheer attack is what I was faced with. She began yelling, pointing, causing a scene, name calling, and just downright being rude. Contrary to what I thought my reaction would be (ahem-slam her head into the wall behind her ) I was gentle, calm, and began trying to make sense of her madness, even to offer a ‘conversation’ (to no avail). I quoted scripture in rebuttal. (To which I was impressed, I didn’t even know that was in there!) This Cherish, The one who has been overtaken with the mercy and grace of God, has changed my heart of stone to a very soft ball of flesh. It made me realize that all the things I have been saying is true. I am a changed person. God has done something INCREDIBLE through little ole me. As I left, I wondered who told her she could throw stones? When I walked away from that mess of a person, I was somewhat proud of that event that occurred. Even though it was a bash to my “ego”, I realized that I have lost my ego. I realized I have lost my “pride”(which was too big to begin with) and became solely dependent on God to fight my battles for me. It was truly amazing to walk away feeling on top of it. I had nothing to feel ashamed about – though she did. (Though probably too self-righteous to admit it.) The bible warns against this here: Romans 12:16- Be of the same mind toward one another. Do not set your mind on high things, but associate with the humble. Do not be wise in your own opinion. Afterall, Matt 7 says: Judge not lest ye be judged. That experience in itself made me ponder. A hypocrite like that is the reason people don’t go to church. The reason some are afraid to go to church, and who’ don’t lik’e to go to church. It’s because a “Christian” like that is on the pew behind them! It’s Christians who call themselves Christians on Sundays and get into brawls and fits of rage that cause problems. Every saint has a past and every sinner has a future. If you live by those guidelines you realize everyone starts somewhere. I have decided that I will stand for what God wants from me in this lifetime. Though it doesn’t make worldly “sense” to me, I trust God – and my measure of faith is all I have, and it’s sufficient. 1 Corin 2:10 “But God has revealed them to us through is spirit. For the spirit searches all things, yes, the deep things of God. For what man knows, the things of a man except the spirit of the man which is in him? Even so no one knows the things of God except the spirit of God.” Romans 8:1 So now there is no condemnation for those who belong to Christ Jesus. EVERYONE is a sinner. But it is in honestly, sincerely, wholeheartedly asking God to forgive you of it – that makes you new and forgiven. Proverbs 18:19- Pride goes before destruction, and a haughty spirit before a fall. Better to be of a humble spirit with the lowly, than to divide the spoil with the proud. Now the works of the flesh are evident which are: adultery, fornication, uncleanness, lewdness, idolatry, sorcery, hatred, contentions, jealousies, outbursts of wrath, selfish ambitions, dessentions, heresies, envy, murders, drunkenness, revelries, and the like; Of which I told you in a time past that those who practice such things will not inherit the kingdom of God. But the fruit of the spirit is love, joy, peace, longsuffering, kindness, goodness, faithfulness, gentleness, self-control. And those who are Christ’s have crucified the flesh with its passions and desires. IF WE LIVE IN THE SPIRIT, LET US ALSO WALK IN THE SPIRIT. So, to the lady at the restaurant… I will advise you (as a Christian) read Galations 5:19-26. As I read it, I suffer the condemnation of the flesh. (As do you.) It seems to me that you and I are just alike in Christ’s eyes. However, I walked away and WALKED IN THE SPIRIT in the face of attack. 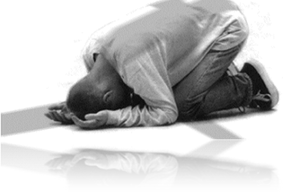 Every Knee will bow, and every eye will close. "When Jesus Christ shed his blood on the cross, it was not the blood of a martyr; or the blood of one man for another; it was the life of God poured out to redeem the world. "—Oswald ChambersⒸ 1996-2019 Heartlight, Inc. This material may not be reproduced in part or whole for commercial use without written consent. "Nails were not enough to hold God-and-man nailed and fastened on the Cross, had not love held Him there. "—Catherine of SienaⒸ 1996-2019 Heartlight, Inc. This material may not be reproduced in part or whole for commercial use without written consent. "Come all crosses, welcome, welcome! so I may get my heart full of my Lord Jesus. "—Samuel RutherfordⒸ 1996-2019 Heartlight, Inc. This material may not be reproduced in part or whole for commercial use without written consent. "For I seek not to understand in order that I may believe; but I believe in order that I may understand, for I believe for this reason: that unless I believe, I cannot understand. "—Anselm of CanterburyⒸ 1996-2019 Heartlight, Inc. This material may not be reproduced in part or whole for commercial use without written consent. "Accustom yourself gradually to carry Prayer into all your daily occupation — speak, act, work in peace, as if you were in prayer, as indeed you ought to be. "—Franois FnelonⒸ 1996-2019 Heartlight, Inc. This material may not be reproduced in part or whole for commercial use without written consent.